Give to us this holy day, for there is no other, day. Thy kingdom is. Thy kingdom always has been. Thy will be done, for I do not know or understand. I was born blind and cannot see. Give to us our daily bread, for besides you the giver there is no other. I know you need not forgive our shortcomings for you know not the same. As master of all and that which makes me breathe and walk and talk, you could never lead me to temptation. You are love and love is the natural in between. The image shows an epitaph on the South wall of St Stephen’s Cathedral in Vienna – on a sunny winter day. 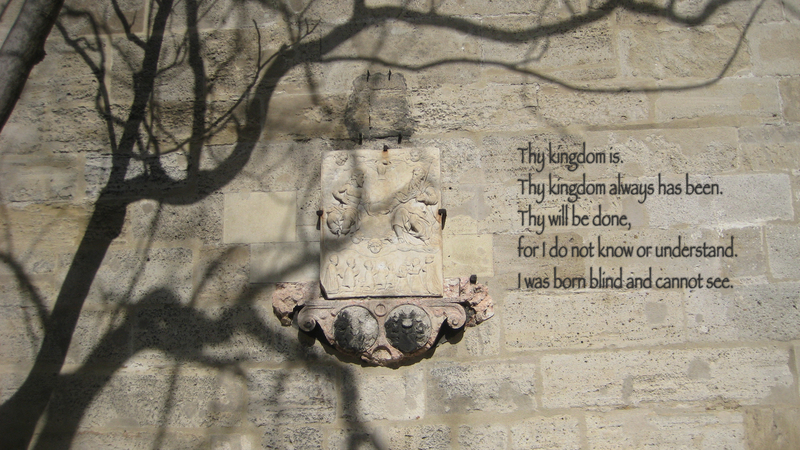 This entry was posted in Prayer and tagged Lord's Prayer, Prayer, Religion and Spirituality, Temptation by Michaela. Bookmark the permalink.